The Apostle James, Brother of the Lord – was the son of Righteous Joseph the Betrothed (Comm. 26 December). From his early years James was a Nazorite, a man especially dedicated to God. The Nazorites gave a vow to preserve virginity, to abstain from wine, to refrain from eating meat, and not to cut their hair. The vow of the Nazorites symbolised a life of holiness and purity, commanded formerly by the Lord for all Israel. When the Saviour began to teach the nation about the Kingdom of God, Saint James believed in Christ and became His apostle. For his God-leasing life he was chosen first bishop in the Church at Jerusalem. 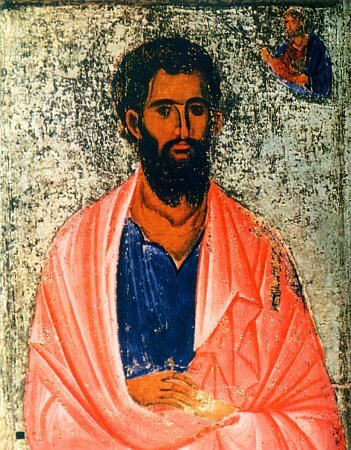 Saint James presided over the Council of the Apostles at Jerusalem, and his word was decisive (Acts 15). In his thirty years as bishop the Apostle James converted many of the Jews to Christianity. Annoyed by this, the Pharisees and the Scribes plotted together to kill Saint James. Having led the saint up on the roof of the Jerusalem Temple, they demanded that he renounce the Saviour of the world. But the holy Apostle James instead began to bear witness, that Christ is the True Messiah. Then the Jewish teachers shoved him off downwards. The saint did not die immediately, but gathering his final strength, he prayed to the Lord for his enemies, who at this while were stoning him. The martyr's death of Saint James occurred in about the year 63. The holy Apostle James composed a Divine Liturgy, which has formed the basis of the liturgies, composed by Saints Bail the Great and John Chrysostomos. The Church has preserved an Epistle of the Apostle James, which under his name is included among the books of the New Testament of Holy Scripture. In the year 1853 the Alexandria Patriarch Hierotheos sent to Moscow a portion of the relics of the holy Apostle James. The Church makes a distinction between the holy Apostle James, Brother of the Lord, from James the son of Zebedee (Comm. 30 April) and James Alphaeus (Comm. 9 October).